Rule #1: Have something to say. Rule #2: Say it clearly. Rule #3: Say it like you mean it. Rule #4: No amount of technology can help you with Rule #1. Phil is the Founder and President of ICOM Multimedia, a company specializing in creating business presentations used in sales, training, technical and financial communications. He operates an imaging service bureau and interactive multimedia production facility located in Columbus, Ohio. He devotes considerable time to applying new media technologies and methodology to the presentation needs of business utilizing computer graphics and digital media. Phil speaks frequently on presentation effectiveness and digital imaging techniques as well as small business issues such as customer service, marketing, and sales. From the beginning of ICOM in 1972, virtually all of ICOM’s corporate efforts and those of Phil Yoder have focused on assisting in the development, production, and delivery of effective business presentations. While new technologies have changed the production processes and dramatically impacted the delivery method of presentations over the years, the emphasis has remained on content development, reliable delivery, the coaching of speakers, and the achievement of specific business results. Consulting – Works with a wide variety of clients to accomplish audience analysis, economic feasibility studies; appropriate media choices, and the coaching of speakers. Handbook, instructional and technical writing for print; Speechwriting and coaching where the presenter/content-experts are not polished presenters; Web flowcharting, outlining & content writing with sensitivity to technical and human-factors constraints. Photography – Accomplished in large format, 35mm & digital still photography; Experienced with basic videography and editing techniques. Graphic Design – Proficient with CorelDraw, PowerPoint, Photoshop, & numerous support packages – but prioritizes the appropriate use of these to persuasively communicate facts, concepts and ideas. Multimedia Programming – Regular user of Macromedia Director, SoundForge, Premier etc. 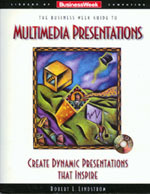 to produce presentations appropriate for the intended delivery environment and audience. Staging – Design, Organization, technical specification and directing of large meeting venues – audiences to 6000 - including lighting, sound reinforcement, video & data projection. Web Design – Has conceived, designed and constructed numerous web pages and manages several dozen for current clients. WebCasting – Design, production & publishing utilizing SofTV & Windows Media Encoder. Manages numerous live and 24/7 viewable webcasting programs.